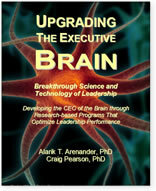 “Upgrading the Executive Brain” fulfills a longstanding need by offering a unique understanding of the brain-based mechanics of optimal growth of leadership development not seen to date in any leadership book or article. Only a few books even mention brain dynamics, and yet the integrative activity of 100 billion brain cells in the human brain are making decisions each moment that support either success or failure. 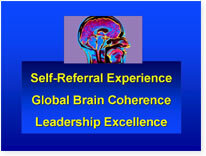 Only a handful of books present the empirical analysis of personal growth underlying leadership competencies. Yet the significant relationship between creative potential, leadership ability and brain coherence are crucial to understanding the fundamentals of raising leadership performance. The major deficiency in creating the highest levels of leadership development is that, until now, no book offers a reliable technology to provide the most advanced mode of personal transformation, a state often alluded to, but rarely experienced, and even more rarely reliably cultivated. Few are acquainted with the scientific advances that support a reliable, research-based strategy to systematically raise leadership performance. The level of individual and organization transformation achieved is directly related to the development of one’s creative potential. The level of creative potential is associated with the degree of integration or coherence of brain functioning. The level of brain integration is maximally developed through the practice of a proven, extensively utilized meditation training, the Transcendental Meditation technique. Any executive can reliably maximize their leadership competencies in a holistic and integrated fashion, while counteracting the harmful effects of daily stress through the use of this natural mental technology.